Food Adventures of a Comfort Cook: First Time for Everything. Yesterday I decided to try something for the first time - baking an upside down cake. Roy had purchased several cans of pineapple to snack on, the pineapple that is, not the cans. Since that seemed to be the typical fruit to use for this type of cake, I figured why not? 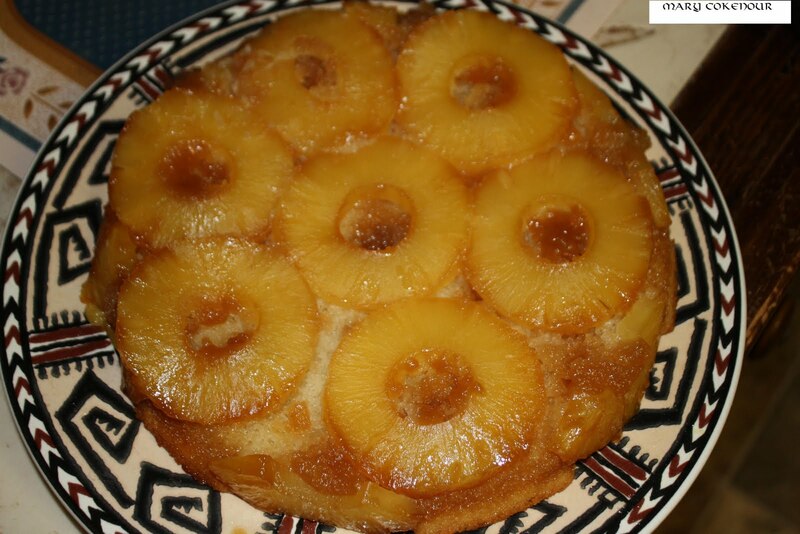 I printed out a few recipes and they all seemed exactly the same, some adding cherries to the center of the pineapple rings, some not. Some using cake flour, others using all purpose flour; so I went with what was in the pantry. Oh, and I had run out of milk, so used half n' half instead which made the cake itself very light and moist. I like this trial and error stuff, it works out well most of the time, and I've noticed my attempts at baking are getting much better, or so the critics tell me. 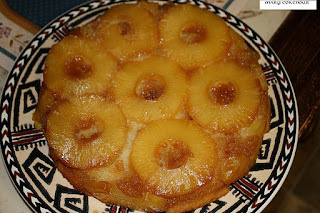 So here's my attempt at Pineapple Upside Down Cake. Preheat oven to 375F; using a nonstick 9” cake pan, pour melted butter inside and sprinkle brown sugar over evenly. Drain pineapple, but retain 2 Tbsp of syrup. Arrange 7 slices over the butter and brown sugar; cut the 3 remaining slices in half and arrange around the side of the pan. In a medium mixing bowl, sift together the flour, sugar, baking powder and salt. In a small bowl, mix together half n’ half, egg, vanilla and retained pineapple syrup. Add liquid and softened butter to dry ingredients and beat until smooth; pour into cake pan and try not to shift pineapple slices. Bake for 40-45 minutes; until cake is golden brown and pulls away from edge of pan. Let stand for 5 minutes; turn upside down onto serving dish, tap bottom and sides to release cake. Serve warm.